The technical complexity of projects is increasing across all industry sectors. Project managers are having to specify more precisely the skills and competency levels needed for successful project delivery. There may only be a few individuals that meet each requirement, but resorting to lesser skilled staff can have significant ramifications for the project. Maintaining a comprehensive skills database is the logical starting point. How does this work in practice? Project managers can easily specify the skills and competency levels required for each task. 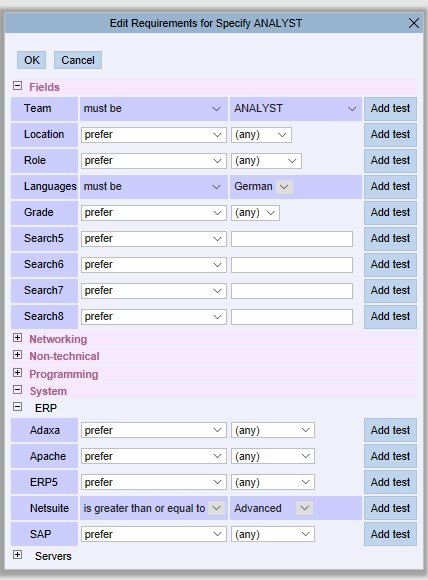 For example, System > ERP > Netsuite with a minimum competency of Advanced is shown as a requirement in the screenshot below. Note that the skills database is presented as a skills matrix structure. 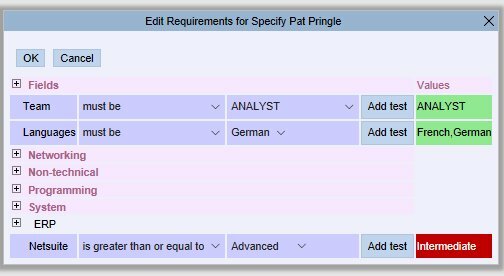 Non-compliance of Pat Pringle, the proposed Analyst, is highlighted in red. Role, Discipline or Team – often used when looking at capacity planning. Their Skill sets, each with a level of competency, e.g. JAVA – Advanced, C++ – Basic, etc. Details of their systems or applications expertise. Grade – often used to link to a standard cost rate. Industry sector experience and qualifications. More detailed data, such as history of recent projects worked on, personal aspirations and development goals etc, can also be incorporated. Innate resource management software enables you to customise the skills database to suit. For some industry sectors, such as Oil and Gas, maintaining the competency scores and certifications for technical staff is crucial. Each Role will have its own set of Skills with related competency descriptions, and each individual’s level needs to be maintained. This leads to the skills database becoming a skills matrix. Enabling individuals to apply for recognition of new skills and increased competency scores they have gained, is a good incentive for keeping the data current. This is a simple 2 step process of request for review, followed by acceptance or rejection. Many organisations also interface their skills database with the HR system. Who has what skills and competencies, with a summary table giving the numbers for each skill and competency level. Demand vs capacity by skill report, which highlights trends and identifies staff retraining/recruitment requirements as necessary.